PARIS (AP) — When Jose Mourinho showcased his motivational powers by guiding Inter Milan to the Champions League eight years ago, it cemented his reputation as the most ruthlessly effective coach in Europe. The “Special One” — as he first called himself — danced with unabashed joy on Barcelona’s field and jabbed his finger in celebration after felling Europe’s team of the moment on the way to Inter’s unexpected success. It was a massive coup. But now, following a string of bad results and some high-profile clashes with star midfielder Paul Pogba at Manchester United, his aura is waning and he finds himself firmly on the back foot. Has Mourinho lost his touch? Perhaps not yet, but he is under significant pressure heading into Tuesday’s home game against Valencia and a loss to the Spanish team could push him nearer an embarrassing United exit. The good news for Mourinho is that Valencia has won just one game this season, although that was on Saturday. Valencia lacks firepower — mustering five goals so far — and United’s defense may get a welcome break after some sloppy performances. Other coaches have points to prove, too, not the least Mourinho’s cross-city rival Pep Guardiola. City won the Premier League in style last season but has yet to be convincing in Europe, and a home loss to French side Lyon in the opening round of games hardly helped. Bayern Munich’s coach Niko Kovac will also be motivated following a Bundesliga defeat. Bayern hosts Dutch side Ajax after losing its Bundesliga lead to Borussia Dortmund. Bayern was held at home by modest Augsburg before losing Friday at Hertha Berlin, and the players are determined to make amends. “A week ago you had the impression we were unbeatable. Now a bit of reality has set in,” Bayern forward Thomas Mueller said. Bayern notched seven straight wins under Kovac, and eight would have tied Carlo Ancelotti’s record for the best start as Bayern coach. Kovac gave the players a day off on Sunday ahead of the visit of Ajax, which beat AEK Athens 3-0 in its opening group game, and is led in attack by veteran poacher Klaas-Jan Huntelaar. Greek champion AEK is at home to Portuguese side Benfica, which lost 2-0 to Bayern in its opener. Manchester City, the first team to reach 100 points in winning the Premier League in May, has struggled in the Champions League. The loss at home to Lyon two weeks ago was its fourth straight in the Champions League. With Guardiola back on the sidelines after serving a one-match UEFA ban, City plays at German club Hoffenheim, which drew its opener at Ukrainian side Shakhtar Donetsk. Guardiola will again turn to prolific Argentina striker Sergio Aguero. No City player has played a role in more Champions League goals than Aguero — 26 goals and six assists — and the striker even managed to score in a Premier League win over Brighton on Saturday despite a foot injury. Lyon’s mini-winning streak of three games ended Saturday when it drew 1-1 at home to Nantes. But with France forward Nabil Fekir in form, Lyon will be confident of beating Shakhtar at home and keeping the top spot. CSKA Moscow’s defenders may be sleeping a little easier ahead of Real Madrid’s visit to Russia. They no longer have to worry about Cristiano Ronaldo, who now plays for Juventus, and Madrid is out of form after just two wins in five matches. The defending champions are also troubled by injuries. Forward Gareth Bale was substituted at halftime of Saturday’s derby draw with Atletico Madrid because of a muscle injury, while left back Marcelo missed the match with a muscle problem in his right leg. Goal-scoring midfielder Francisco “Isco” Alarcon underwent surgery for an appendicitis last week. While moving its European home games to the vast Luzhniki stadium displeased some local fans, it will ensure a big home crowd at the venue where Russia knocked out Spain at the World Cup. Roma fans will be expecting a home win against Czech side Viktoria Plzen. After selling off the backbone of the squad — goalkeeper Alisson to Liverpool, midfielder Radja Nainggolan to Inter Milan and midfielder Kevin Strootman to Marseille— Roma is starting to gel. Roma enjoyed a convincing 3-1 win over Lazio in Saturday’s Rome derby. An Old Trafford encounter between two struggling teams: Manchester United and Valencia. 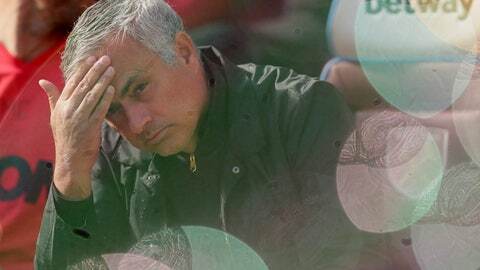 This isn’t what Mourinho envisaged early into his third season in charge at United, although he did drop warnings in the offseason when he moaned about the lack of depth in his squad. A week of torment saw United held by Wolverhampton, a modest Premier League newcomer, then knocked out of the League Cup at home by second-tier Derby before being soundly beaten 3-1 at West Ham on Saturday. After clashing with Pogba, it was Anthony Martial’s turn to feel Mourinho’s wrath. He criticized the France forward’s contribution in defense against West Ham. It means forward Alexis Sanchez, who has not looked anything like the player he was at former club Arsenal, could return against Valencia. Swiss side Young Boys don’t have to worry about Ronaldo for the daunting trip to Italian champion Juventus, because the Portugal star is suspended for one game. But Juventus’ confidence is high following a 3-1 win against title rival Napoli, and Mario Mandzukic will be hungry for more goals after netting twice.